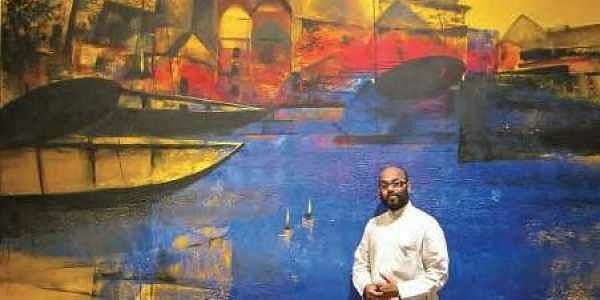 HYDERABAD:Art plays an important role in a child's development and enables children to develop a sense of aesthetics and beauty from an early age -- but it should not be imposed, says noted artist Paresh Maity, whose vast oeuvre includes India's longest painting at 850 feet. "The most important thing to developing a child's mind through art is to not impose anything. Let them grow in their own way... an innocent mind will develop its own identity and possibilities. The medium allows them to express themselves and explore their creative side and develop a sense for aesthetics and beauty from an early age," Maity told IANS in an email interview. It was in this spirit that he conducted a day-long session at a Mumbai school on Friday and termed it a "learning experience". "It was a fantastic experience to meet and conduct a session for students of Mount Litera School International as part of their ongoing Meraki art week. It was astonishing to see the creativity in them and the fabulous exhibition they had curated. My visit to the school was a learning experience for me as well because when the mind does not have any preconceived ideas, I learn a lot. "While this wasn't a first-time effort and I have been to different cities and schools, it was great to witness the truly extraordinary art displayed by the kids," he added. "Art has a crucial role to play in the holistic development of young children through its integration of fine motor skills, language development, conceptual understanding in math and other subject areas. Children learn to bring all these together through using their hands, visualisation and through words to express what they have drawn or created. Art has its own language, which is universally understood," Ruchika Sachdev, head of the school's primary section, told IANS in an e-mail. The school visit also prompted Maity, 53, to reminisce about his own four-decade journey in the world of art. "I was seven-years-old when I saw artisans in my native village -- Tamluk in West Bengal -- making idols of Goddess Durga. I was mesmerised and decided I wanted to be an artist. It has been a burning desire since then," said Maity, who has almost 80 solo exhitions to his credit. At the age 16, after his matriculation, he wished to get admitted in Calcutta's (now Kolkata) Government College of Art and Craft but his father's colleagues persuaded him to appear for joint entrance exams for medical and engineering. "I was never attentive towards my studies as my mind would always wander towards art. Finally, at the age of 18, after my higher secondary education, I took an admission to the Government College of Art and Craft in 1983. "Since I was a little child I have been inspired by miniature and tribal art. My first influential mentor was nature and people that I used to interact with on my commute to college. I would travel for four hours each way to reach my college from Tamluk since I did not have enough money to stay in Kolkata. I did this for six years," he said. "My journey, like that of any other individual, has been full of ups and downs and filled with good and bad experiences. We all go through it. I will be the happiest if my journey with art continues till the last day of my life," Maity added. As for "Indian Odyssey", which is displayed at Terminal 3 of New Delhi's Indira Gandhi International Airport, he said when he was first approached, he did not not think it would be possible to create it. "It depicts India's people, places, history, colours, festivals, culture and integrity in a very unique way. When I was first requested eight years ago to make this painting, I was surprised because I could not believe an artist could make such a big painting, measuring approximately 850 feet. I expressed a desire to see the original place where the painting would be installed. It took me a year to complete the painting and was a truly extraordinary experience," Maity explained.